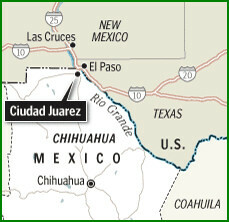 A city in the Mexican state of Chihuahua, Ciudad Juarez issued its own license plates for 2 years (1963 and 1964) when it suddenly found itself on the "wrong side" of the Rio Grande due to a shift in the river's flow. It became separated from the rest of Mexico, and declared itself an indepentent area - neither part of Mexico nor of the USA. The vertical letters "NPI" on the plates stand for "no paga impuestos" or "don't pay taxes". The 1965 Chihuahua plate - also with the stacked NPI - is a recent find.